Angel of God, my Guardian dear, to whom God's love commits me here. Ever this night/day be at my side to light and guard, to rule and guide. Angel, my counselor, inspire me. Angel, whom God has assigned to lead me, govern me. Queen of the Angels, pray for us. All holy Angels and Archangels, pray for us. Holy Guardian Angels, pray for us. of the heavenly Father, pray for us. Holy Guardian Angels, who never part from us, pray for us. Holy Guardian Angels, our faithful admonishers, pray for us. of the evil enemy, pray for us. Holy Guardian Angels, our support in the time of temptations, pray for us. Holy Guardian Angels, who help us when we stumble and fall, pray for us. Throne of God, pray for us. Holy Guardian Angels, who through your inspirations and encouragement help us to progress in the good, pray for us. Holy Guardian Angels, who despite our faults never leave us, pray for us. Holy Guardian Angels, who rejoice over our improvement and advancement inperfection, pray for us. Holy Guardian Angels, who watch over us and pray for us even when we rest, pray for us. Holy Guardian Angels, who console the souls in Purgatory, pray for us. Holy Guardian Angels, who lead the righteous into Heaven, pray for us. behold God, pray for us. Noble Princes of Heaven, pray for us. Lamb of God, Who takes away the sins of the world, spare us O Lord! Bless the Lord, all His Angels, you mighty ones who do His Will. He has sent His Angels before you, to guard you on all your ways. My God, in the presence of the Angels, I will bless You. I want to adore You and praise Your holy Name. Lord, hear my prayer. And let my cry come unto You. Almighty, Eternal God, in Your ineffable goodness You have assigned a special Angel to all men, from the womb onwards, as a protection for body and soul. Graciously grant that I may follow my holy Angel so faithfully and love him so dearly, that through Your grace and under his protection I may one day reach the heavenly Father's House and may merit to behold Your Divine Countenance together with him and all the holy Angels. Through Jesus Christ, Our Lord. Amen. 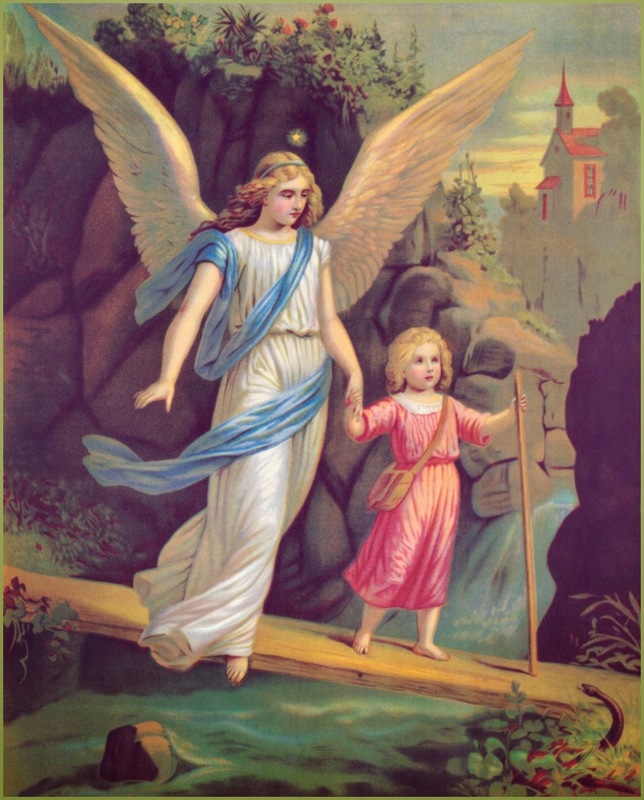 Go, my Angel Guardian dear, To Church for me, the Mass to hear. Go, kneel devoutly at my place and treasure for me every grace. At the Offertory time Please offer me to God Divine. All I have and all I am, present it with the Precious Lamb. Adore for me the great Oblation. Pray for all I hold most dear, be they far or be they near. Remember too, my own dear dead for whom Christ's Precious Blood was shed. And at Communion bring to me Christ's Flesh and Blood, my Food to be. To give me strength and holy grace , a pledge to see Him face to Face. And when the Holy Mass is done, then with His blessing, come back home. Amen. Heavenly Father, the moment You created my soul, You gave me to the care of an angel to enlighten, guard, rule, and govern me. I thank You for Your infinite goodness to me. I thank you also, my guardian angel, for accompanying me every day on my journey back to heaven. It is a great comfort for me to know that you give me holy inspirations, that you defend me from dangers to soul and body, and that you pray to the Father for me. enlighten and guard, rule, and govern me. Amen. My guardian angel, you always contemplate the Lord and you want me to be your fellow citizen in heaven. I beg you to obtain for me pardon from the Lord for being very often deaf to your counsels, and for sinning, unmindful of your presence. My guardian angel, faithful and strong in virtue, you are among the angels in heaven who, led by St. Michael, conquered Satan and his followers. That fight of old continues on earth today: the powers of evil are against Jesus Christ to ensnare souls. Pray to the Immaculate Queen of Apostles for the Church, the city of God that fights against the city of Satan. O Archangel St. Michael, with all your followers, defend us in the war; be our strength against the malice and snare of the demon. O that the Lord would subdue him! And you, the prince of the heavenly court, drive away into hell Satan and the other evil spirits who seek to ruin our salvation. O angels of paradise, take care of writers, technicians, and distributors of all media and all who use them. Guard them from spreading evil, guide them in truth and obtain for them true charity. Ask the Lord for necessary vocations to combat evil and accompany them in their delicate mission. Inspire all people to contribute with deeds, prayers, and offerings for the conversion of hearts and the salvation of souls. Pray that we serve to raise the standard of human life and direct the human race towards eternal good. All you angels of the Lord, you have been called to form a noble court, to praise and bless continuously the Holy Trinity, to make up for our forgetfulness. You are true lovers of God and of souls, and you continue to sing, "Glory to God in the highest, and peace on earth to people of good will." We pray that all may know the true and only God, the Son sent by Him, and the Church, the pillar of truth. Pray that the Name of God may be held holy, that the kingdom of Jesus Christ may come, and His will may be done on earth as it is heaven. Protect and guide the civil authorities, the workers, and the suffering; obtain blessings and salvation for all those who search for truth, justice, and peace. against the malignant attacks of all my enemies. Keep me away from all occasions of sin. and of faithfully putting them into practice. the favor which I ask for by this novena. in the mansions of everlasting happiness.